List of different Activities that can be created on ClassTag and step-by-step instructions on how to do it. The beauty of ClassTag is that you can organize virtually anything that has a date. 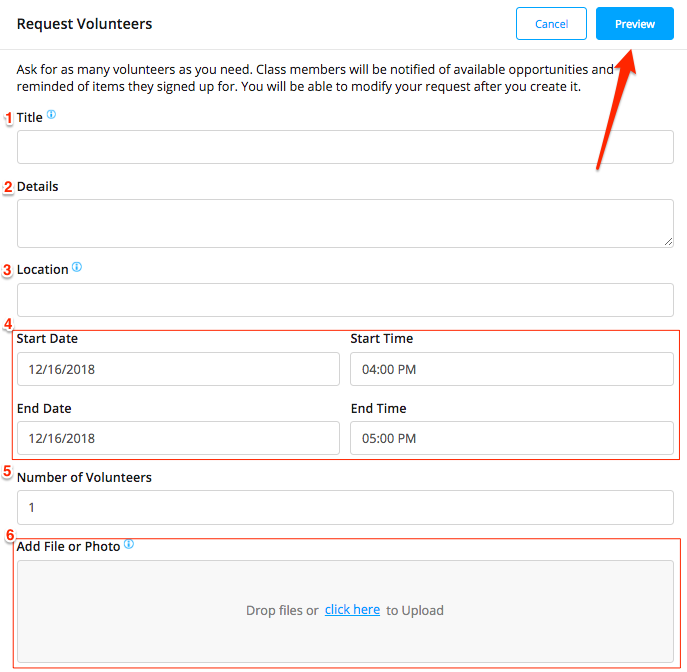 Whether you are looking to include assignments or days off, or schedule parent teacher conferences or volunteers, all of these options are available on ClassTag. Not only parents will be able to sign up with one click or RSVP, they will also be automatically reminded according to their individual status. Stay organized by creating activities to keep parents on track with everything that is going on in your class and your school. To create an activity, click the "+" orange circle button at the top right of your desktop screen, or tap the orange circle on your tablet or mobile screen, and select the type of activity you wish to create. Once you create an activity it will be visible in Activities tab. Below you will find key activities that you might be looking to organize and the best activity type on ClassTag. To view or save the cheat sheet, please follow this link. Events are a great way to organize a party, inform parents about something you are doing in a class, request volunteers for different types of activities in one place, ask parents to join school or class event or even keep parents on track with assignments that you don't need students to turn in. Provide the (1) title, (2) details, (3) location of the event. For an all day event, tick the box before the "All Day" (4). Checking this box will ask for the start and end date only. If the event is not for the whole day, indicate the (5) start date/time and end date/time of your event in the appropriate fields. 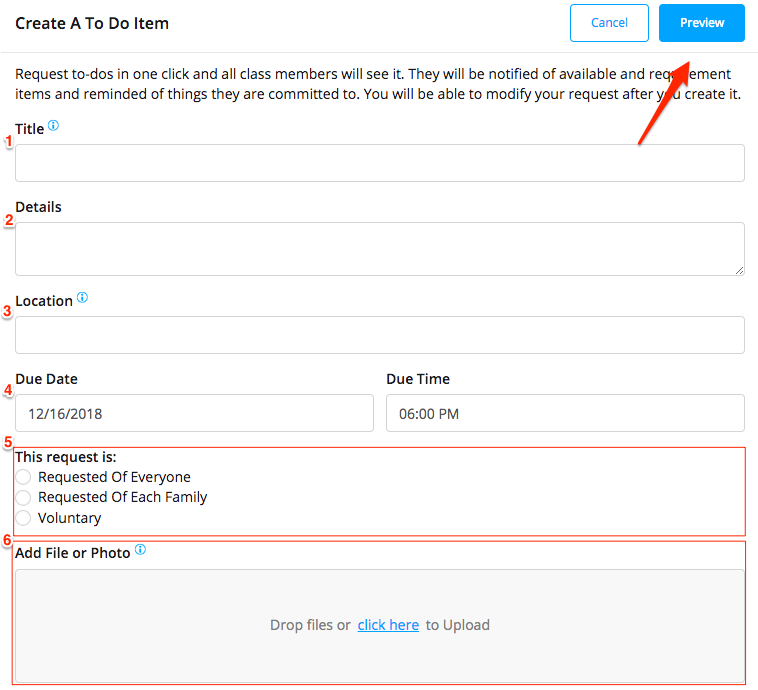 Upload any relevant photos or documents in the (6) “Add File or Photo” section by clicking on “Click Here” or simply drag and drop the files to the box. 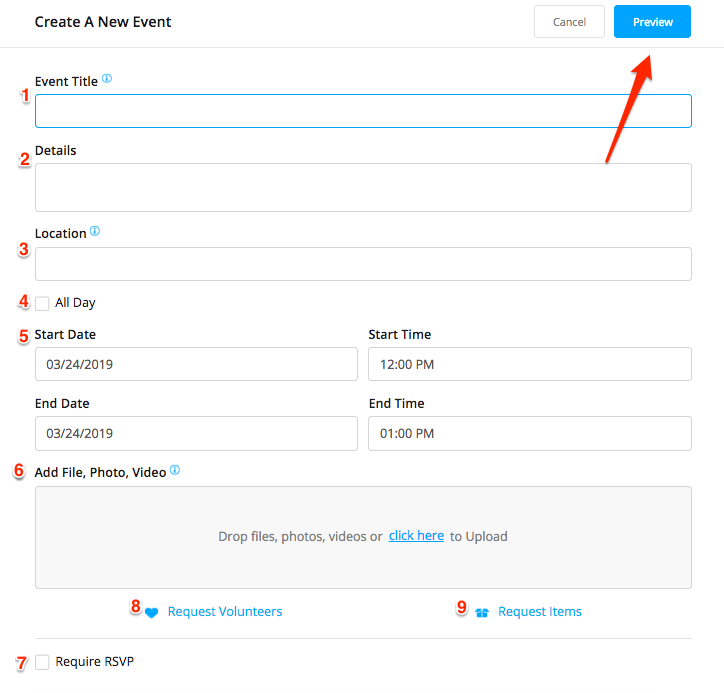 Coordinate replies by checking the (7) “Require RSVP” box while creating a new event, so that parents let you know whether they are attending the event or not. Does your event need volunteers or staff? If so, click the (8) “Request Volunteers” and add the details. Maybe your event requires some volunteers who are willing to provide an item, instead of time? If so, click on the (9) “Request Items” and add the details. If you have different groups of items, please add separate item requests for them (e.g., you might want to have one request for balloons, one for party hats and one for pizza). We recommend adding the number of items you want each volunteer to contribute in brackets. For example, use “Balloons (5 each)” to request for 5 balloons for each volunteer. 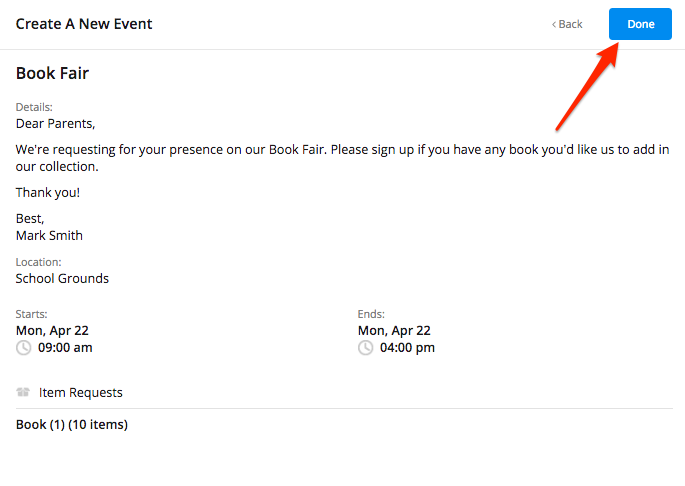 When you've finished entering the relevant information, click the “Preview” button on the upper right side of the page to save and publish your event. The next page will show you a summary of the event. Click “Done” to proceed. The next page will give you an option to “Announce” it by clicking on the “Announce” button or simply click the “I’m Done” button if you don’t want to announce it. Once you specify the details and click Create Event, it is launched and live on ClassTag apps and website. 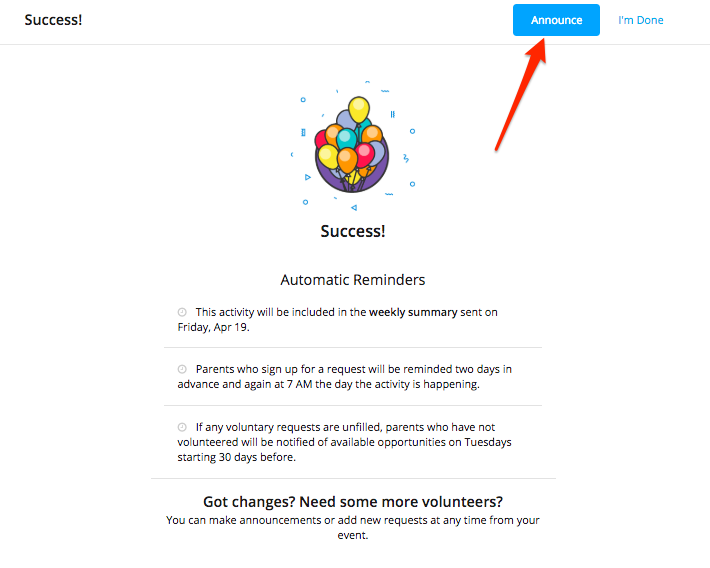 Notifications to parents' emails and phones will go out only if you clicked the “Announce” in the process of creating an activity or you announced it from the little wheel next to activity name at a later time. Otherwise, the activity will be communicated to parents according to reminders schedule that you can see in the little wheel next to activity name as well. For more information about notifications, see the article on communications. Individual volunteer requests are great for simple volunteer requests such as field trip chaperones or activity leaders. You can send a volunteer request from any classroom tab you are monitoring. Click '+' sign and ask for help with a “Volunteer Request”. Provide the (1) title, (2) details, (3) location, (4) time and date when you need the parents to go (5)time and duration(4) of your event in the appropriate fields. Indicate the (5) number of volunteers you’d like to have. If applicable, upload any relevant photos or documents on the (6) “Add File or Photo” section. Once done, click the “Preview” button on the upper right side. The next page will show you the summary of the Volunteer Request that will be sent to the parents. Click “Done” to proceed. To-Do Item is great for requests that require parents to complete an action. For these requests, parents need to physically 'check the box' in order for this request to be marketed completed. Some common examples include: submit permission slips, medical records, reading logs, etc. Provide a (1) name for the to-do request, (2) details, (3) location, (4) time and date the request is due, and indicate if the (5) request is for everyone, each family, or voluntary. The next page will show you the summary of the To-Do Item that will be sent to the parents. Click “Done” to proceed. Do you need to set up a Parent Teacher Conference or office hours when parents can come and check-in with you? This functionality makes it incredibly quick and easy to set it up! Please review a quick video and step-by-step instructions in a separate help page here. Now that you have created some activities, see "How Do I Track Activities on ClassTag?" for information about how ClassTag makes it easy to stay on top of the activities you have created, easily coordinating and managing the details with the intuitive and sleek ClassTag interface.